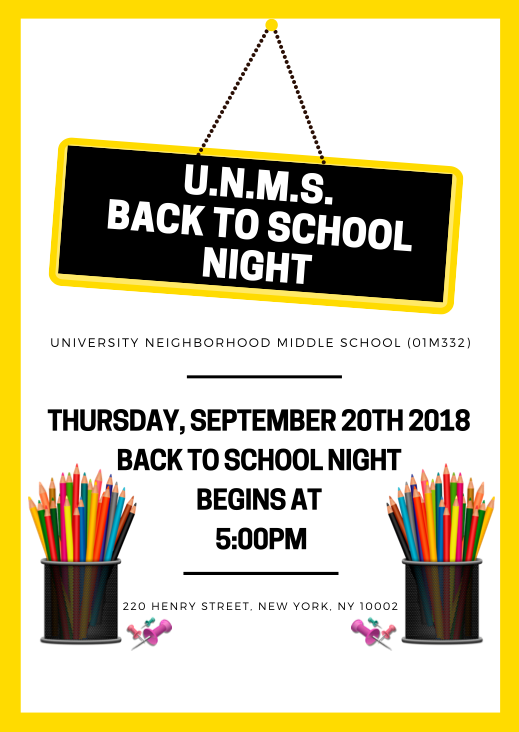 Join us this Thursday, September 20th at 5:00pm for our annual UNMS Back To School Night! School-Based Health Center personnel and address any health related concerns and/or immunizations that your child may need to update his/her medical records. Then, meet with City Lore and get to know their work in four cultural domains: urban folklore and history; preservation; arts education; and grassroots poetry traditions. In each, we seek to further cultural equity and model a better world with projects as dynamic and diverse as New York City itself. During this evening, you will also meet with 0our Henry Street Middle School Success Center staff and review all matter related to the 2018-2019 High School articulation process regarding selections, decisions, visits and much more. Lastly, get to know your UNMS PTA at our Back To School Night! The UNMS PTA will have a table on the 3rd floor in front of room 332 where you can share laughs, suggestions and feedback that will help us have the most amazing year for the 2018-19 Academic School Year. AND REMEMBER... At UNMS, together we make the difference!